The leaves rustle as she turns to lie on her back, the barren trees glaring at her from above, almost threateningly. She brushes aside a strand of hair from her face, closes her eyes and breathes deeply. Why did he have to leave me like that? Was it something that I did? The questions haunt her. She enters a room, the darkness of it making her alert. She stands erect, holds her breath and tries to listen. Not a sound. The subconscious then speaks, through her, to her, directly. She is drawn to the opaque voice, follows it as it enters another door. A room filled with memories, this one. Memories and pain that she had suppressed for so long. The grime floats around her, mockingly, hard to ignore. Don't you remember? A voice booms. No. It isn't true. I loved him. I was happy with him. I wouldn't have acted the way I did, if that were true. The burden of your sacrifices was getting too heavy for me to carry around. I acted on your behalf. I knew that's what you wanted, him out of your life. I know you, better than you do yourself. move away from his penumbra. But one can't run away from their own subconscious. She rushes through the night sky to her cottage just outside the park, her bones crackling as she runs and quickly bolts the door behind her. Three clicks it takes to lock it completely, after which she collapses on the floor. There's no proof! It's just my guilt that's pushing my imaginations to the extreme. Guilt, that I couldn't stop him. Couldn't or wouldn't? Or was it you that pushed him, letting him drown in the harsh currents? The hollow reappears, sucking her in. Why are you afraid to open the door to the truth? She presses her hands on her ears, screaming in agony. Stop it! Leave me alone. Let me mourn in peace. You need to remember, the way it exactly happened. You can't make me vanish. I am you. I'd like to remember things in my own time, my own way; I know who I am and I know how much he meant to me. There's silence now, only sounds of her whimpering. Misty eyed she tries to look for the voice but its gone. Her lips break out into a sly smile as she gets up and walks to the kitchen. She lets the tap running as she splashes her face with cold water, feeling relieved, pleased. As pleased as she had, on the day she had let him go. Hope you'll join me in this week's #SaturdayWordplay challenge. The word prompt this week is 'Penumbra' - (n.) - the partially shaded outer region of the shadow cast by an opaque object; something that covers, surrounds, or obscures; a peripheral or indeterminate area or group. Prose or poetry, just pick this word and let it flow! Looking forward to reading your posts! Wonderful story! Love the suspense and build-up and the resolution at the end! 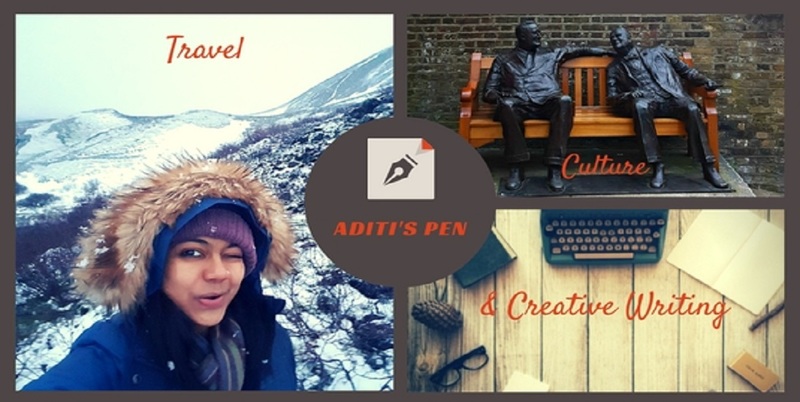 What a story Aditi! Loved the narration. Thank you Ramya! And thanks for linking up, loved your take on the word prompt as well! Oh Aditi, my wonderful storyteller - u rock at this:-) May 2016 bring many of your stories, dear friend!! Loved the narration! You sure are getting better with every story Aditi! OMG,Aditi that was absolutely splendid! Brilliantly imagined, beautifully and vividly penned! Take a bow Lady O'Henry!